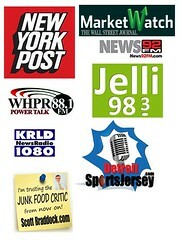 I am sure you have all been asking yourselves, “What is Junk Food Critic’s favorite cookie”? It’s a question that shall bother you no longer. It is, dear reader, the mighty-mighty TIM TAM. Did you know that the Oreo is America’s most popular cookie? 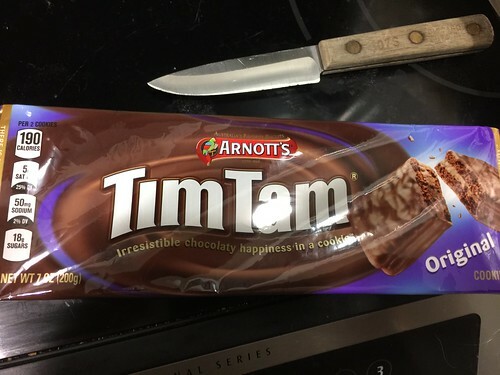 Well in Australia, it’s the TIM TAM – also known as an Arnott’s Original. It’s chocolate, on chocolate, on chocolate. It’s absolutely fantastic and I can’t sing their praises loudly or often enough. The knife is in the picture as a subtle reminder to NOT try to take one of my Tim Tams while I am busy telling you how great these are. These are just heavenly and up until about a year ago the only place that carried them was World Market. Thankfully Target has decided to now carry them as well and they are always an instant purchase whenever I find them. And one day I will teach you the Tim Tam Slam. It will change your life. Forever. Categories Addictive, Sweets, This S#!+ is ADDICTIVE! !